The Andong region in southeast Korea has traditionally been an aristocratic neighborhood and its dishes- from fresh mackerel from the East Sea and earthy heotjesabap- reflect that. Another dish, known as geonjin guksi or simply guksi, is most commonly associated with this region as well. Meaning "scooped out" noodles, the noodles of this soup dish has a signature extra thin consistency that still has bite to it and is considered a must for the jesa tables of families from this region. Nestled between high rise apartment buildings near Jeongneung, Bonghwa Mukjib is often considered to serve one of the best Andong-style guksi, as well as the region's other flavors, in Seoul. Located within an old residence, Bonghwa Mukjib has been in business some 35 years though it has relocated some 5 times in the same neighborhood since its opening. Started up by a couple who moved to Seoul from the Andong region, as a poor, former farming family, they worked numerous jobs after their move to the capital to make the family's ends meet until a family friend, who was a fan of their tasty homemade food, suggested the couple starts their own restaurant. Basing their menu off classic favorites from their hometown like handmade dumplings, maemil (buckwheat) mook, the geonjin guksu, etc and with their affordable prices, it quickly grew into notoriety and remains a favorite for local residents and the many visitors to the nearby Jeongneung royal tomb (though not to be confused with the Jeongneung royal tombs in Gangnam, near Coex) which has quite an illustrious and fascinating, if not tragic, history to it. As I mentioned, this is essentially a two story Korean home which had its first floor converted into a restaurant. These sorts of home/restaurants are common but less so in Seoul and giving you that cozy sort of feel you get from restaurants in Korea's countryside. Just a few feet away from our table was the cute matriarch casually tending to her ingredients while watching TV. Full spread minus the dumplings. From left going clockwise is the son kalguksu, the maemil muk, seasoning, chopped peppers, pickled peppers, dongchimi, and kimchi. Kimchi differs by regions and the southeast Gyeongsangdo region is known for their robust and bold flavors which is reflected in their homemade kimchi here. Pungent and strong, this is definitely a contrast from the lighter Seoul/Gyeonggi style kimchi. On the other hand, the dongchimi is light and refreshing. The mookbap is a wonderful assortment of flavors and textures ranging from the nutty and slightly chewy acorn mook to the mouthwatering piquant flavors of the refreshing broth. With such a range of flavors, often the secret to a good mookbap is the sesame oil. Enveloping but not overpowering the flavors, this is a refreshing dish done right here and elevated by the homemade mook and kimchi. Guksi is a dish I've previously written about and the marrying of soft ribbon-y noodles and mellow beef broth is one that anyone will enjoy. The best Andong guksi are supported by two main factors- a deep but gentle broth and thin, feather-soft noodles that carries the delicious broth with every chopstick-full. Both more than pass the test here. For those who like a kick, chopped peppers are provided on the side. A bit more divisive in opinion is the handmade mandu. I think anyone who knows me well knows I'm a big fan of homemade mandu and the palm-sized ones here come gleaming and shiny, fresh from their steaming. Generally the filling is one that's a mixture of a main protein (pork, shrimp, etc) and some aromatic herbs/seasoning and ingredients for flavor and texture. These are decisively kimchi mandu which, I'm also normally a fan of, but the kimchi as I mentioned before, is quite strong. Not only is the seasoning quite sharp but the leafier, green, mature cabbage used for the kimchi gives it a slightly heavier and borderline (but mild) bitter undertone to it. Though it's nothing bad by any means, it's a rather bolder mandu that I personally wasn't too fond of. I say this, though I ate up every last one of them. And washed down with the smooth, milky broth of the guksi and then ending with a last sip of the refreshing dongchimi as a palate cleanser and consider it a temporal visit to Andong without having ever left Seoul. This is a great place to stop by before exploring the Jeongneung royal tombs while sampling the flavors of the southeast Gyeongsang region. The added bonus of Bonghwa Mookjib being that its home setting and homemade dishes gives it the feel that you're enjoying a meal at a home in this region- even if you're still right in the middle of Seoul. This is a bit of a doozy for those that aren't accustomed to taking the bus as it's quite a distance from the nearest subway station. From Sungshin Women's University Station's exit 6, walk up just a few meters and you'll see a bus stop. Take the Seongbuk 22 bus and go 8 stops to get off at the Jungang Heights Ville Apartment bus stop. 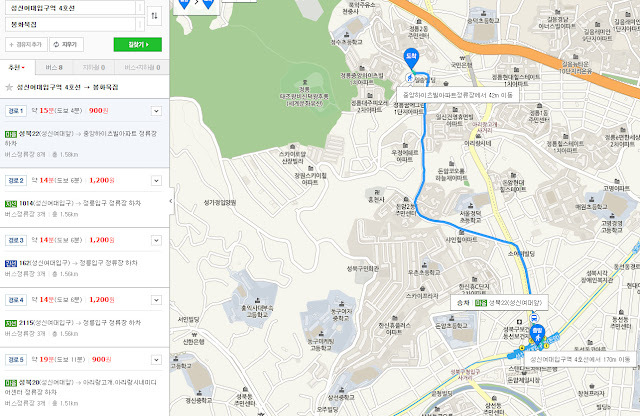 Or take buses 1014, 162, or 2115 and go three stops, getting off at the Jeongneungipgu bus stop. You'll have to cross the street and head west along Arirang-ro 19gil for about 200 meters to find the restaurant. The good news is that the upcoming UI light rail line is scheduled to be completed later this year (2017) which would mean you would only have to do the final 200 meter walk from the new Jeongneung Station of this line to get to here. Available but only for about 2 or 3 cars. They sell house made dongdongju which goes well with many of their dishes. They also close quite early in the evenings- 7PM every night. Want to go, need to go.